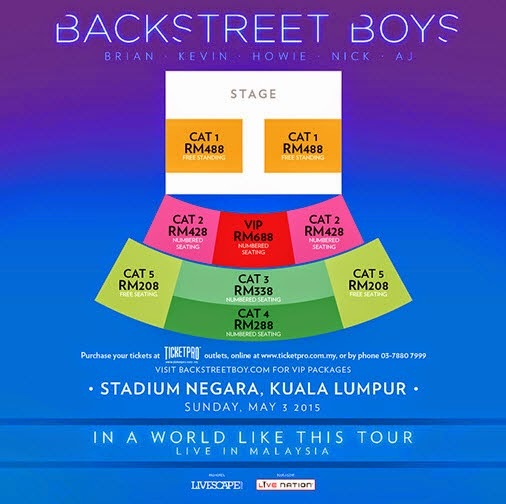 Kuala Lumpur, February 2015 - Backstreet Boys, the world’s best-selling boy band will be heading to Malaysian shores as part of their “In A World Like This” tour on 3 May 2015 that will be held at the iconic Stadium Negara. Organized by The Livescape Group, the one-night-only show is set to attract over 6,000 fans of all ages. The five piece American pop vocal group was formed in 1993 and consists of members A.J. McLean, Howie Dorough, Nick Carter, Kevin Richardson and Brian Littrell. The band shot to fame with their self-titled debut album, Backstreet Boys in 1996. Following the success of their first album, the Backstreet Boys released their second international album Backstreet’s Back in 1997. Singles from this album include “Everybody (Backstreet’s Back)”, “As Long As You Love Me” and “All I Have To Give”. 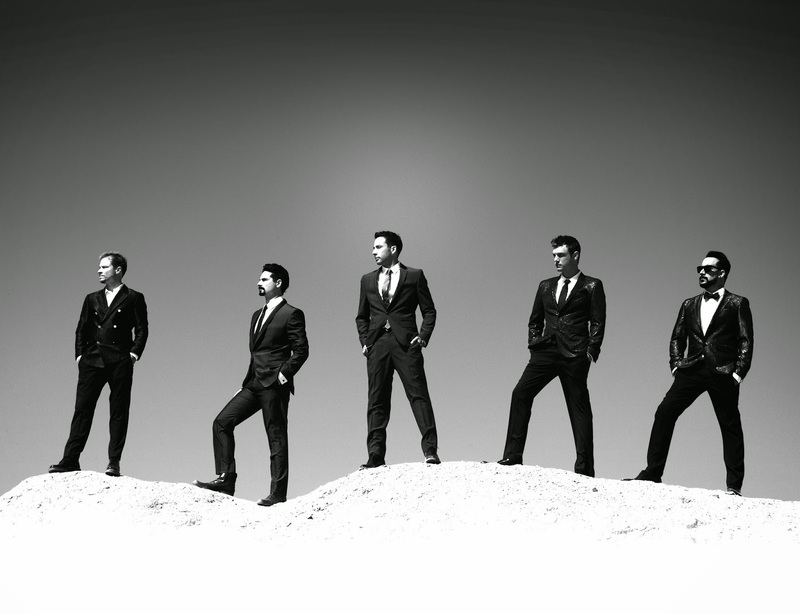 The single “Everybody (Backstreet’s Back)” and “All I Have To Give” peaked on the U.S. Billboard Hot 100 at no. 4 and no. 5 respectively. The then teenage heartthrobs not only won the hearts of many with the success of their first two albums but rose to even greater heights and superstardom with their third album Millennium in 1999. Singles from this album include “Larger Than Life” which peaked on the U.S. Billboard Hot 100 at no. 25, “I Want It That Way” which peaked at no. 1 on both the U.S. Billboard Top 40 Tracks and the UK Singles Chart, and “Show Me The Meaning Of Being Lonely” which peaked at no. 6 on the U.S. Billboard Top 100. The Backstreet Boys released a fourth album, Black and Blue in 2000 as a follow up album to Millennium and the most popular single from this album is “Shape Of My Heart” which peaked on the U.S. Billboard Hot 100 at no. 9. They’ve sold over 130,000 million records worldwide, making them the best selling boy band in the world. The group took a two year break before releasing a comeback album Never Gone in 2005. After successfully completing their Never Gone Tour in 2006, band member Kevin Richardson, left the group to pursue a solo career in singing, modelling, and acting. Nevertheless, the Backstreet Boys continued promotions as a four piece vocal group and released two albums, Unbreakable in 2007 and This Is Us in 2009. In 2012, the group made fans worldwide happy when they announced that Richardson had rejoined the Backstreet Boys permanently. 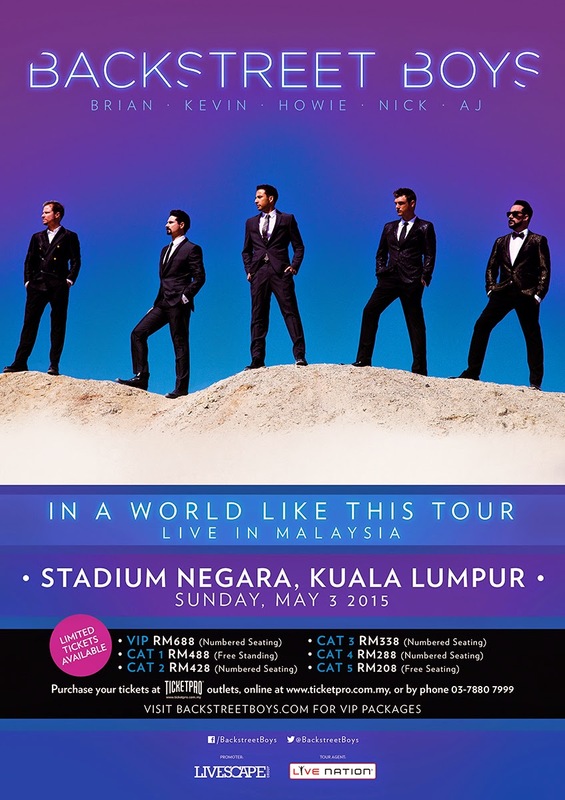 In 2013, the band celebrated their 20th anniversary by releasing their first independent album, In A World Like This.The Backstreet Boys “In A World Like This” Tour in Malaysia will take place at Stadium Negara, Kuala Lumpur on May 3. Tickets are priced between RM208 – RM688. Tickets will be on sale from February 7 onwards via www.ticketpro.com.my.